head and back in harmony with the curve and flexibility of the spine. Not much weight falls on the knee. Three points touch the mat. These are the foot of the extended leg, the lower part of the bent leg and the hand of the supporting arm. Place something under the knee if it hurts when weight is put on it. Earth energy will extent from the toes and foot of the extended leg all the way up through the body and arm. It can be challenging to put the foot of the extended leg flat on the mat. It is not necessary to tilt into a backbend. 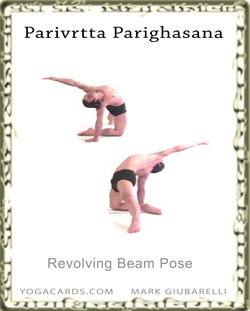 You can perform a posture similar to Parsvakonasana where the body is sideways and the placement of the supporting hand in in horizontal alignment with the hips. This posture stretches anterior muscles in the shoulders and chest muscles such as the pectoralis major. This posture is generally liked when introduced in class. Make modifications for students if a knee or shoulder condition is present. Injured areas may be aggravated or in danger.